Description: Seaport Block H is the newest edition to the Innovation District of Boston. The mixed-use development will consist of 16,000 sf retail and office space, as well as a 6,000 sf Chapel and a 2,500 sf public plaza. Working with developer Boston Global Investors, Fenagh makes its first appearance on the Boston skyline. 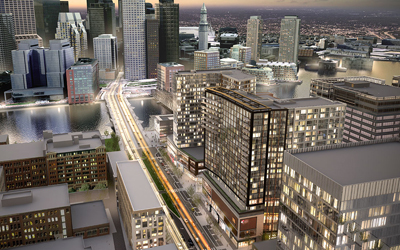 This project is part of the larger development of residential and commercial property in the seaport area. Scope of Work: Fenagh Engineering and Testing will be performing all special inspections for Seaport Block H, including roofing inspection, structural steel inspection, masonry, building envelope testing, and concrete sampling & testing.